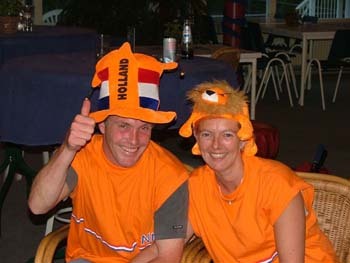 Typical attendants at the yearly "Racket4s" tournament in Rotterdam. Together with Hungary, who are organising their first racketlon tour event next week-end, the Netherlands seem to be at the verge of a racketlon breakthrough. 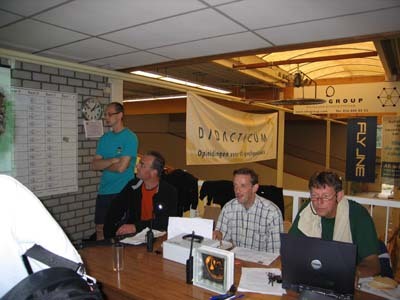 A couple of weeks ago the first racketlon Dutch Open was announced (see newsitem) for December 2006. At that time it was identified as the "first Dutch racketlon tournament". Now this information has to be revised since Racketlon.com has just been reached by the news that another tournament is being planned for the 18th of April, already (see also the Events section). This mid April tournament will be a national event held in connection with the Dutch National Week of Sport in co-operation with the Dutch Olympic Committee and the Dutch federations of all the four individual racket sports. It will be open for 32 men and 16 women. The strongest players from the last three years of the "Racket4s" (see description below and this racketlon.com news-item from 2003) events will be invited and, in addition, the four individual federations will actively scout for the best all-round players in their respective communities. In addition, a "VIP" tournament for racket skilled Dutch celebrities is being planned to take place in connection with the elite event, which, together with all of the above, should give plenty of support to the outspoken ambition to get coverage on national television. These should be very inspiring news for the whole racketlon community! It is especially worth noting that all four individual racket federations are involved. This has not often been seen during previous racketlon history although one should not forget that this was actually how racketlon got started in Finland in the mid Eighties. (One representative from each of the four Finnish federations got together and decided to do something together...) Surely, all country representatives and tournament directors, this is an area that could do with some exploitation! Imagine the potential if the racket talents of the individual federations were systematically tapped for the benefit of racketlon! 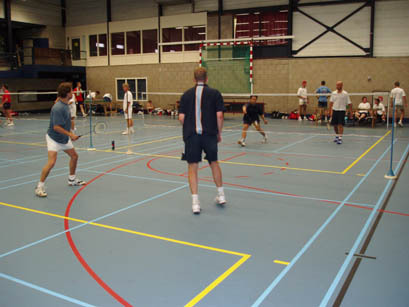 There was a 5 rackets tournament in Rotterdam from 1985 to 1995. It was a team tournament of 8 teams with 8 players. The tournament lasted one day and each team had to play each other and each player had to play the five sports against his opponent of the other team, so everyone had to be on the court for about 8 hours during that day. Tennis and Badminton was played in doubles and Squash, Table Tennis and Foam Ball was singles. Dutch Top players from all over the country of all of the four main sports participated during the ten years. Most of the years the final was between the Mentink Famliy (4 very gifted brothers and some friends) and The Racketeers/Victoria Squash combination. 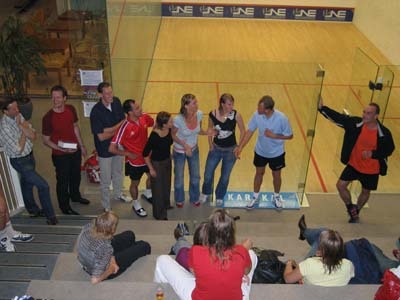 To the left: Vanessa Atkinsson, the Dutch Squash World Champion, 2004. Currently ranked 2 in the world. 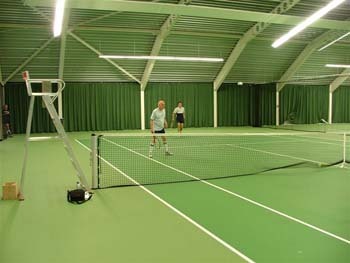 Some images from the Rotterdam sportcenter where the racket4s tournament is held. The organisers stopped in 1995 and except from some local events almost nothing happend until 2003 when Victoria Squash started with the Racket4s tournament : Racket force, 4 Rackets. The tournament for ball magicians and racket jugglers with physical strength and endurance. 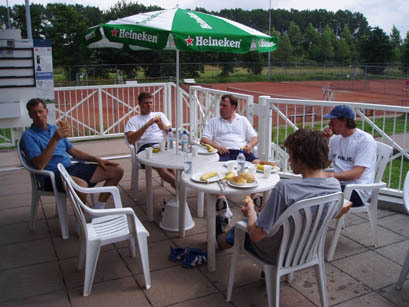 The setup was quite similar to the former 5 rackets tournament: a one day team event. During the last three years we had quite some big names from Badminton, Squash and Tennis participating in the tournament. Peter Amerika. 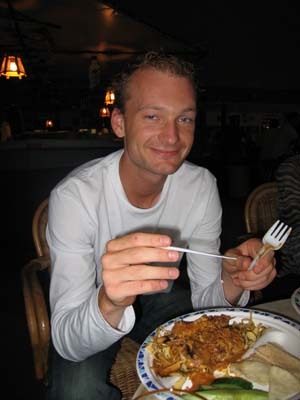 The individual winner of the 2005 Racket4s tournament and a participant at the 2005 Vienna Racketlon World Championships. Marc Veldkamp - at the far right - working hard at the tournament desk. Next article in this "State of Racketlon" series coming up within the next few days: The Czech Republic. They have tradition too!